The respiratory system consists of the set of organs involved in the uptake of oxygen from the atmosphere and the release of carbon dioxide generated during aerobic respiration. This gas exchange is also called breathing or external respiration. Organs specialized for breathing usually contain moist structures with large surface areas to allow the diffusion of gases. They are also adapted to protect the organism from the invasion of pathogens along those surfaces. In fish, this gas exchange occurs through gills. Some invertebrates, like cockroaches, have simple respiratory systems made of interconnecting tubules directly delivering oxygen to tissues. In humans and other mammals, there is an extensive, highly vascularized organ system specialized for gas exchange. It begins in the nose, continues into the pharynx and larynx, leads to the trachea which branch to create bronchi, and bronchioles. This respiratory tree ends in puffy structures called alveoli that are made of a single layer of squamous cells, surrounded by a network of capillaries. Gas exchange occurs within alveoli. Since external respiration in many vertebrates involves lungs, it is also called pulmonary ventilation. Changes to the volume and pressure in the lungs are the primary driving forces for breathing. The primary function of the respiratory system is gas exchange. Animal cells use oxygen and produce carbon dioxide as a byproduct. Not only do animals need a way to get more oxygen into the cells, but they also need a way to remove carbon dioxide. The respiratory system provides this functionality. The lungs or gills of an animal remove carbon dioxide while delivering oxygen to the blood. This oxygen is carried to the tissues. The tissues deposit their carbon dioxide waste, which is then carried back to the lungs for release. While the primary function of the respiratory system is gas exchange, this extensive organ system also has some other roles. In humans and other mammals, the respiratory system is integral creating sounds such as those used for speech. Structures of the upper respiratory tract, especially the larynx, are involved in the production of sound, and can modulate pitch, volume and clarity. Making noises is called phonation. The nose plays an important role in respiration, but the olfactory nerves and their associated structures are also involved in sensing smell. This has functions ranging from digestion (the cephalic phase of digestion) to hunting, recognition, and mating. Most animals have some sort of olfactory senses, usually in the form of nerves within the respiratory system. Sharks, for instance, can smell blood in the water up to several miles away. Terrestrial predators, like wolves, also use their olfactory senses to detect prey. The cells of the respiratory tract also protect the body from the invasion of pathogens through the nasal passages. They have an important role in the immune system since the respiratory tract is one of the organ systems with intensive and repeated interaction with the environment (the other is the digestive system). Epithelial cells in the airway can secrete antibodies, defensins and various enzymes and peptides, as well as small oxidative molecules that hamper pathogenic colonization. In addition, some of these epithelial cells also secrete mucus to trap larger dust particles. The respiratory system plays host to a specialized lymphoid tissue that can produce lymphocytes as a first-line of defense. Coughing and sneezing are other important mechanisms used to fight infections, by removing large quantities of bacteria or viruses trapped in mucus. The cells of the respiratory tract can help in removing clots in pulmonary blood vessels. They also activate hormones and either remove or add to the substances circulating in the blood. They can make incoming air warm and moist, in order to protect the delicate cells of the inner respiratory passages. Finally, epithelial cells of the lung also produce surfactant that makes the process of inhalation and exhalation easier. In fact, adequate production of surfactant by fetal lung cells is an important prerequisite for viability in pre-term births. In humans and most mammals, there are three parts to the respiratory system. The first is the series of conducting tubes that carry air from the atmosphere towards the lungs. The second part consists of the muscles of respiration – the diaphragm and intercostal muscles in the ribs. The lungs form the third part. The diaphragm is a dome-shaped muscle that curves upwards towards the lungs. When it contracts, it becomes flattened and therefore increases the volume of the thoracic cavity. Similarly, contraction of the external intercostal muscles moves the ribs upwards and outwards. This increase in volume leads to a drop in pressure within the lungs, allowing air to flow passively into the airways. Gas exchange occurs at alveoli till these muscles relax, reversing the process. But, the diaphragm is not alone. 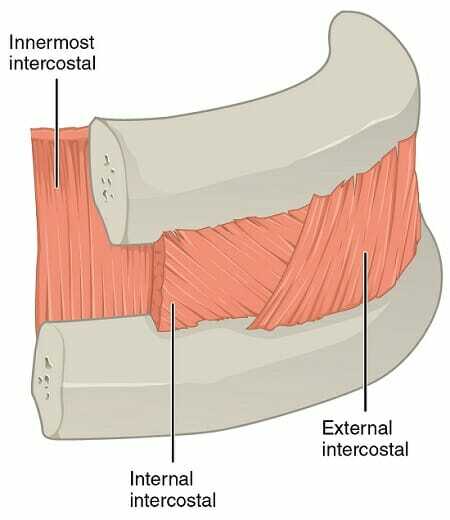 The intercostal muscles, as seen in the picture below, provide expansion and contraction of the rib cage, which furthers the movement of air in and out of the lungs. The airways can be divided into the conducting and respiratory zones. The conducting zone begins at the nose and ends at smaller bronchioles, and these passages carry air towards the inner recesses of the lungs. The respiratory zone contains the terminal bronchioles and the alveoli – the sites where gas exchange occurs. The nose and the mouth form the main external openings and mark the beginning of the conducting zone of the airway or respiratory tract. The nasal cavity situated behind the nose contains hair and filters and humidifies air. Most large environmental pollutants are trapped in the mucus secreted by the cells of the nose and nasal cavity. The mouth is unable to reproduce all the functions of the nasal cavity and acts as a second opening when the nose is either blocked or when there is an immediate need for large quantities of air. Air then passes into the pharynx, which is also involved in swallowing. The epiglottis prevents the movement of food into the respiratory tract and the misdirection of air towards the esophagus. When the epiglottis doesn’t function properly, small particles can enter the trachea. These are removed through coughing. If food is lodged or stuck in the airway, it may need to be quickly removed through abdominal thrusts, also known as the Heimlich maneuver. The larynx follows the pharynx and its main function is the production of sound. The flow of air through this region can influence pitch and volume. Air then enters the trachea, a long tube that is covered by a series of cartilaginous rings, which help this tubular structure retain its shape during inhalation and exhalation. The trachea is lined by pseudostratified columnar epithelia with goblet cells secreting mucins and helping to form mucus. The trachea splits to form two primary bronchi, called the left and right bronchi. Each of these leads towards a lung and then undergoes repeated branching to produce secondary, tertiary bronchi, and bronchioles, with successively smaller diameters. When the bronchioles are less than a millimeter in diameter, they are called terminal bronchioles, whose purpose is to end in vascularized alveoli. As the bronchi begin to branch, their internal structure changes. Cartilage is more common in the larger airways, and a single epithelial layer is common in the smallest parts of the conducting zone and the respiratory zone. Bronchi and bronchioles both contain smooth muscles that can constrict in times of rest, or dilate during exercise. Lungs are made of spongy tissue containing many vascular tissues and much of the airway that appears after the trachea. A pleural membrane allows these paired organs to expand and contract with minimal friction. The left lung is smaller than the right due to the location of the heart on the left side of the thoracic cavity. The organs described above work as a functional unit within the respiratory system. Air is taken in through the mouth and nose. From here, it makes its way down the trachea. The trachea splits into the bronchi of each lung, where it further divides into a number of smaller tubes that lead to the alveoli. These tiny sacs within the lung are the actual sites of gas exchange. The alveoli directly contact tiny capillaries from the circulatory system and are able to pass small gas molecules and some waste products across the cell membranes separating them. Oxygen is added to the blood, while carbon dioxide is taken into the alveoli. When the breath is released, this carbon dioxide is released into the atmosphere. The oxygen will make its way via the circulatory system to the tissues, where it will release its oxygen and pick up more carbon dioxide. Thus, the cycle of respiration repeats itself constantly. Diseases of the respiratory tract can arise due to obstruction to the airway, constriction of the passages, or the loss of the extensive surface area of alveoli for gas exchange. There could also be difficulties with the capillaries surrounding these alveoli, either due to clots or due to altered cardiac function. These illnesses could be chronic conditions or temporary infections. They could also simply be minor changes to the breathing pattern, as seen with hiccups. The common cold, appropriately named for its ubiquitous nature is caused by a large number of different viruses, with rhinoviruses being the most varied and common cause for this complaint. It is usually an infection of the upper respiratory tract, though it can occasionally spread towards the ears, or the lower respiratory structures as well. The infection is transmitted through direct contact with the infected person, especially their nasal discharges. This is particularly difficult to prevent since a person is infectious before they begin to show symptoms. The viruses usually establish contact with the cells of the nose, which then produce a clear liquid to trap these microorganisms and expel them from the body. This is followed by sneezing and coughing, especially if the virus travels deeper into the airway. Thick, yellow or green sputum being coughed is a sign of these microbes being attacked by the host’s immune system. Antibiotics are useless against viral infections and the symptoms usually subside after a week. On the other end of the spectrum of infectious diseases of the respiratory tract is tuberculosis, or TB. It is a bacterial infection caused by Mycobacterium tuberculosis and until the advent of powerful antibiotics, could often lead to death after a painful illness. The infection spreads by the transmission of live bacteria from the infected person, especially through oral and nasal discharges. Since the bacterium is hardy and can exist in a desiccated form for many months, the illness can quickly reach epidemic proportions in regions where population density is high, or there is a prolonged cold season where people stay indoors and interact closely with one another. Many healthy children and adults can overcome an infection without obvious symptoms, where only a blood test can confirm that an infection has occurred. The disease is named after the hard nodules that form within the lungs, called tubercles. These tubercles can not only erode respiratory tissue, but they can also attack the blood vessels, leading to the patient coughing up blood. This is a dramatic symptom indicative of an advanced stage of the disease. The advent of HIV and AIDS brought tuberculosis to the forefront, with the original tubercles of a resolved infection breaking down and releasing bacteria into the bloodstream. Immunocompromised individuals, whether infants, the elderly, or those with autoimmune diseases, become susceptible to the recurrence of this ailment. Treatment usually involves multiple antibiotics over an extended period of time. Caregivers need to be vaccinated. Lung cancer is the development of a malignant tumor in the lungs, associated with uncontrolled cell growth within the tissues and the metastasis of these cells to other organs within the body. Smoking, especially when begun at an earlier age, is the highest risk factor for developing lung cancer. Passive smoking is often equally dangerous. In recent history, King George VI died of complications relating to lung cancer, brought on by years of heavy smoking. Though tobacco smoking accounts for over 80% of lung cancer cases, any chemical substance that repeatedly irritates the delicate inner linings of the lung can lead to the formation of a tumor. These include asbestos, chromium, nickel, radon gas, uranium dust, coal dust. The most common organ for the metastasis of lung cancer is the bone. Therefore advanced stages of the disease also involve pain in the bones. 1. Which of these structures marks the beginning of the respiratory zone of the airway? 2. 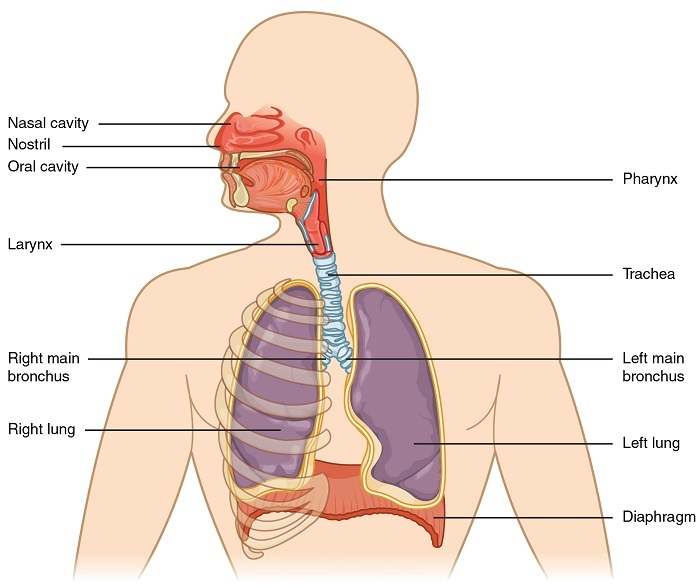 Which of these is a function of the respiratory system? 3. Why aren’t antibiotics useful during a common cold infection? 4. If you are working around patients with tuberculosis, why is it important that you get vaccinated for the disease? A. It is not important, you will be fine. 5. What are the 3 main parts of the respiratory system? Vander, Arthur (2008). Vander’s Human Physiology: the mechanisms of body function. Boston: McGraw-Hill Higher Education. pp. 332–333. Marieb, Elaine; Katja Hoehn (2007). Human Anatomy & Physiology (7th ed.). Pearson Benjamin Cummings. p. 142. Sherwood, L., & Ward, C. (2015). Human physiology: from cells to systems. Toronto: Nelson Education.